AKA: - This area is also known to many as Hanging Gardens due to the abundance of plant-life at various points along the cliffs. Round-trip: - Really depends on whether you climb the cliffs and how much exploring you do. You can have a very pleasant hike to the cliffs and back to the campsite in 2-3hrs. The round trip described below can be done in 4hrs. I would recommend starting early and spending as much of the day as you can on the round-trip including side trips. Alternatively make several trips and vary the routes. Difficulty: - Generally easy walking. The scramble up the gully is not exposed but most will find it exciting. Liz fear factor: - 6/10 Took a couple of attempts to feel confident going up the gully but now she just enjoys the excitement. Chirri dog factor: - Easy, except that I need help climbing the gully. Plenty of animal tracks and scents to follow. A few donkeys and goats to chase. I've been wondering what the toads taste like. Occasional pools of water to drink at, and plenty of rocks to shade under. I think there is another dog living in the farm, although I used to think it was the echo of my bark. I know this area so well that you can just follow me and you will never get lost. Dangers: - Take care in the gully and close to the edges of the cliffs. Take plenty of water as you are pretty exposed on the plateau. Wildlife and plants: - A lot to interest botanists and birders. Some toads inhabit some of the pools. Navigation: - See waypoints and photo links below. 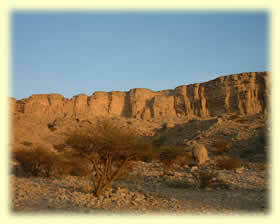 Jebel Qatar is in Oman, close to where the towns of Al-Ain and Buraimi straddle the U.A.E. - Oman border. 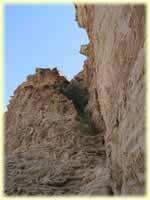 At the foot of the peak is a large plateau which terminates in a magnificent ribbon of cliffs falling down to an area of jumbled rocks and deep wadis. The mountain rises to an altitude of 786 metres at its summit, and the plateau is at around 640 metres. The cliffs, sheer in places, are 40-50 metres high. The deep wadis that cut across the plateau emerge at the cliffs in hanging valleys with a drop of 10 metres or more. At the foot of these waterfalls are deep pools, although these have been dry in recent years due to the lack of rainfall. From the pools the watercourses wend their way through a jumble of scree and large boulders. Some of these wadi beds have giant steps formed by the thick horizontal rock strata and amongst these steps are small pools of water with fish and toads. 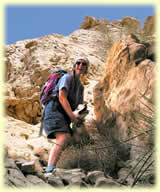 Many of the treks that we do, require a full day to complete, and are also a long drive from our home in Abu Dhabi. One exception to this rule is Jebel Qatar which is under two hours drive away, and provides the opportunity to do a wide variety of hikes of short to medium duration. Here you can climb up to the extraordinary 'Hanging Gardens', walk along the base of the cliffs or climb up onto the plateau. There are many possibilities taking just a few hours so you can make this a day trip. If you live in Al Ain then you can do a hike after breakfast and be home in time for lunch. Don't think for one moment that the area isn't good for camping though. It's easy to find a secluded campsite and with the west facing cliffs which glow a rich shade of orange at sunset, they make a wonderful backdrop to sundowners. The track to the campsite is off to the right of the Buraimi to Mahdah road. From Buraimi, take the road to Sohar and then, turn left to Mahdah just after the Buraimi Hotel. The track to the campsite is reached after about 16.3km from this turnoff. This is waypoint HNGTRN. Follow the most obvious track (taking parallel tracks where possible to avoid the worst of the corrugations), and after 2km turn left at waypoint JN138 on a well defined track immediately after crossing a shallow wadi. This track passes a small ramshackle farm on the left after a short distance. Don't take the track that leads off to the left to the farm itself but continue straight on, ignoring a track off to the right a little beyond the farm. The track bears left and drops into a wadi and then continues on the far bank. The track then climbs slightly, reaching a flat camping area after about 50 metres. Just before the flat area there is a faint track leading off to the right, which re-crosses the wadi, and leads you to another pleasant camping area with a couple of trees. This is just opposite the first site. Both campsites are fine but the latter is bit more secluded. This is waypoint CAMP7 and is 1.8km from JN138. The campsite with the trees is at the junction of two wadis and at the foot of a spur dividing them. Climb up this spur, first crossing an area of slabs, and then up through a jumble of small boulders, resisting the temptation to take the path which traverses off to the left. Once above the boulders bear right, again avoiding a path that traverses off to the left, and scramble easily up onto the plateau which is gently sloping and has the remains of a small building on the left. From here look over towards the cliffs and pick out the gully which slopes up from right to left at 45 degrees and starts at the base of a buttress (see photo). You should be able to see a path leading across the plateau which picks its way through the intervening hills. If you miss the path just keep heading towards the buttress any way you like. If you follow the path then look out for the many fragments of pottery scattered around. This route was probably used by villagers collecting water from the springs at the base of the cliffs. Some pottery is glazed and some is thin and unglazed. The last time we were here some samples were removed for dating, and we also found a broken millstone on the plateau atop the cliffs. As a detour you can veer to the left and follow the banks of the main wadi to your left (this is the wadi that passes the camp site lower down). This route will take you to the base of a deep gully in the cliffs which ends in a waterfall feeding the main wadi. You have to scramble down into the wadi just before reaching the cliffs in order to reach the water. Depending on rains this could vary from a cascade to a dribble! You'll know that you're in the right place when you smell the guano from the many pigeons which nest in the cliffs. Also look out for Shrike, Sunbirds, Bee-eaters, Scrub Warblers, Pale crag-Martins, House Bunting, Desert Wheatears, and Egyptian Vultures. If you took the detour, climb back out of the wadi and work your way a short distance south-west along the base of the cliffs to the buttress where there's a large gnarled tree. This is at the start of the diagonal gully which is the key to climbing the cliff. If you didn't do the detour you'll have picked your way directly from the plateau to the gully. The foot of the gully is a nice place for a rest, there is a shelf to sit on, and in the morning, plenty of shade from the cliffs towering above. This is the GULLY waypoint. Plenty of birds visit the trees and bushes in the vicinity, and the views back down to the plains are superb. Look out for the eerie face mask seen in the large boulder just off to the right. If you follow the path close to the cliff and beyond the tree, you eventually reach a flat fertile area which has obviously been farmed in times gone by. You can detour to this in a round-trip of about 20 minutes. The area is much more interesting after rainfall because it is covered in fresh grass and flowering plants. To reach the top of the cliffs you need to scramble up the gully past a couple of small trees. The way is well protected and easy to climb. Soon the gully comes to an abrupt end, and the only way to proceed is to scramble up the rock to the left. This is an easy scramble and the most difficult bit is the start. Just continue up the gully until it emerges on the smooth slopes at the edge of the plateau. Turn around and admire the view and be amazed at how you've managed to get up the seemingly un-climbable cliffs! Continue up the smooth slopes a little way and you'll reach the flat plateau above. At first it looks like you can wander freely across this vast unspoilt area, but you soon realise that it's scarred with a maze of deep wadis which drain the ridge further back. From this point you have many choices. You can turn right and walk all the way along the cliffs to the waterfall and cave at the other end of the escarpment, or you can climb back down the gully the way you came. You can also make a loop back to the campsite descending the north end of the escarpment on an easy path. This takes about two hours. To take this route you have to negotiate the labyrinth of wadis on the plateau. There are many ways to do this but I'll describe an attractive route which takes you along some of the more spectacular wadis and goes via the top of the waterfall (mentioned above in the description of the detour on the way to the gully). From the point where you emerge on the plateau after the climb up the gully, head across the plateau, perpendicular to the cliffs behind you, and you'll soon reach a deep wadi running roughly parallel to the cliffs. You need to get down into the wadi and travel downstream to the left (north), but at this point the sides are quite steep, so head right, a short distance along the bank, until you find an easy way down into the wadi bottom, and then follow the wadi left. The scramble along the wadi bed is easy but fun. There are a number of Almond trees and shrubs growing along the bed and sprouting out of the steep sides. Soon the wadi joins another much larger wadi, running down from right to left. If you turn left here you'll soon reach the top of the aforementioned waterfall. The point where the wadis join is another attractive place for a rest and bite to eat. Head right (east) up the main wadi until it narrows appreciably and pass a tributary coming in from the right. Just after this is another tributary on the left which sometimes has some pools of water at its mouth. Head left up this side wadi and after a short distance scramble up the bank to the right and emerge once more onto the plateau. Look over to the right at the ridge of hills falling down onto the plateau and starting from the left (north) end of the ridge look for the first very definite cleft going right through the ridge. You have to make your way across the plateau and through this short v-shaped valley. There are many paths leading this way because it's an obvious route for donkeys as well as trekkers! Once through the short pass you are confronted by a massive cliff face on the other side of a large wadi running from right to left. Descend into this wadi and turn left on a very well-defined path. You head down this path, avoiding some smaller side tracks to the left, until you reach a cairned corner in the track, with a sharp turn to the left. This is waypoint CORNER. Here you should see a good path, with occasional cairns, running parallel to the cliffs on the left. The path gradually bears right away from the cliffs and into the main wadi and thence back towards the campsite. The path becomes indistinct in places so keep a sharp look out for the cairns, and avoid being taken along the goat tracks which veer off to the left. Aim to lose height by keeping right. Eventually you should drop into the main wadi, which comes down from the waterfall, just above a large tree, (waypoint TREE !! ), and after crossing it, contour along a path high on the south bank down to the campsite. If you lose the track just drop into the wadi any way you can and work your way down the series of steps in the wadi bed. Enjoy, and watch your step! Since writing the above we've been back to Jebel Qatar several times. Each time we've enjoyed the experience. I'm yet to tire of the place because we always seem to discover something new, and leave with the feeling that there's still much more to do. A recent trip over 2-3 October 2003 was no exception, and despite the heat, we managed two great hikes. As if to prove that we aren't totally mad, hiking in 40°C+ heat, I can tell you that we weren't alone on the mountain; we bumped into three others doing the same thing! OK, maybe that only proves that we're all a little mad! Our first hike was by a 'follow-your-nose' route to the base of the cliffs where we then turned left to a welcome drink stop at the foot of the 'gully climb'. At this point we noticed that one of Chirri's boots had rubbed a sore patch on his paw so, as time was getting on, we decided to call it day and return to camp. The next morning we set out early to climb one of the hills which rise from the plateau above the cliffs. We scrambled up the gully climb (described above), and took the opportunity to record the climb on video. Once onto the plateau we took in the fabulous views, enriched by the excitement of having just climbed the gully. From here we went over to the deep wadi a little way back from the cliffs and turned right along the bank. With the deep wadi to our left, and the cliff edge to our right, we followed the wadi to its source on one of the triangular peaks rising from the far side of the plateau. This is a surprisingly easy climb, and just as well because the temperature was rising rapidly. Fortunately, a slight breeze and the the occasional shady acacia trees, which gave us an excuse for a rest, made the heat bearable. The summit itself sports a fine cairn, with another on a subsidiary peak reached across a saddle to the south. 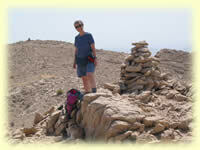 Here the brilliant 360° views are the Jebel's generous rewards for the efforts of the climb. Looking back towards the cliffs you can get a much better appreciation of the intricate pattern of wadis which, like the veins on the back of a hand, criss-cross the plateau and disappear over the cliffs. We started on our way down, and at this point I could tell that Chirri was on the verge of going on strike. He always seems to see summits as a final destination rather than a halfway house. 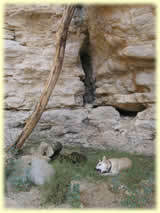 On one occasion after reaching the summit of Jebel Hafeet he curled up and went to sleep; apparently oblivious of the need to descend. I can tell when he's nearly had enough because he finds some shade under a rock or bush, sits down and barks at us to stop. When he realises that we aren't going to comply, he grudgingly follows on and repeats the process at the next shady spot. In the heat of the day, I dreaded getting into the business of having to carry him, so decided to look for some pools of water in the wadi we'd followed on the way up. Sure enough we soon found some substantial if rather green pools, with a large cave next to one of them. The cave was deep, north-facing, and had a smooth floor with a comfortable step to sit on. Now of course, pools of water in terrain like this are extremely important to the local wildlife. We could see that the donkeys had visited regularly, and after a few minutes the local birds plucked up courage to return to the business of drinking the water, and catching the insects at the stagnant pools. Now not only did we have a cool comfortable shelter from the sun, but also a bird-hide! Probably due to the fact that we were in the deep shadows of an ultra bright sunny day, the birds didn't seem to be able to see us. The Crag Martins performed their aerobatics along the wadi just inches from our feet and we were able to observe the normally shy House Bunting, visiting the water hole a few feet away to our right. These birds get their name from their habit of flying into houses through open doors and windows, and true to form several flew into our cave. Having rested ourselves and enjoyed the show, we dragged ourselves away down the gully, and on to our vehicle for a cold drink from the cool-box. Jebel Qatar had once again lived up to expectations; a great place for a weekend trip. If you want to check out the pools and the cave, then from the top of the 'Gully Climb' head away from the cliffs over to the deep wadi in front of you, turn right and look for the first opportunity to climb down into the wadi bed. Once down in the wadi, turn right and the pools are a short distance upstream. The second one is the one with the cave.